If it’s a tutorial that we created, you may use it to make products to sell as long as you credit the pattern to Robyn Vines Smith/Warehouse Fabrics Inc. blog. We sometimes feature other people’s tutorials, though we make that clear in the post and link to them. In those cases, you must ask the original creator. It’s an honor if you like one of our tutorials enough to share it. Please link to it in your blog post rather than cut and paste our tutorial on your site in its entirety. Each post also has share buttons at the bottom, including Facebook, Google + and many other options for quick and easy sharing. 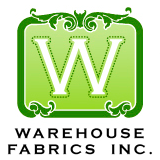 Each month, we give away a $50 gift certificate to Warehouse Fabrics Inc. There are several ways to get extra entries. Sometimes the ones worth more points require more effort and may focus on social media like Twitter or Flickr. Facebook has made its rules a bit more complicated regarding contests, so we are generally staying away from Facebook with the contest entries. We realize that some people don’t have a Twitter or Flickr account, or an account wherever the bonus entry requires, and that it can be perceived as unfair. These are bonus entries. Everyone can still enter through other means. Contest entries must fit the requirements and cannot be repeated or altered to suit the entrant’s preferences. Such entries will not be approved. Thanks for understanding — it’s no easy task moderating the entries and it’s only fair to expect everyone to play by the same rules. Also note that the winner’s first and last name and city/state will be announced on our store website. We love indie designers! If you’d like to have your project/pattern featured, and it’s suitable for our blog and fabrics, please contact Robyn through the blog contact form at the right. You would provide the pattern free of charge for one-time use on the blog. A link would be provided to your blog or store so that readers and potential customers can find you. Please contact Robyn if you have an idea you’d like to see featured on the blog. Please don’t hesitate to contact us with regarding questions or errors you might have noticed on any blog post. A little pillow talk...sham on you! Be the first to hear about special offers and participate in private sales offered only to our newsletter subscribers!